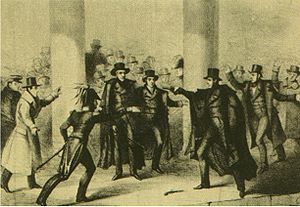 Richard Lawrence’s attempt to assassinate President Andrew Jackson was not politically motivated. Even though he had never met the president, he had a personal score to settle. Lawrence was born in England, and made his way to America when he was young. He ended up working as a painter but became unemployed in the early 1830s. This coincided with a decline in his mental stability. He suffered from delusions of grandeur and believed that he was King Richard III of England, who, inconveniently, ascended to the throne in 1483. His fallacies grew and started manifesting themselves physically. He exchanged his normal conservative dress for more flamboyant outfits and grew a mustache, perhaps to create a disguise. Lawrence convinced himself that his lack of work was inconsequential because the U.S. government owed him money, and that President Jackson was personally preventing him from receiving it. He was confident that as soon he obtained the funds, he would be able to begin his reign as the King of England. Lawrence also held the president directly responsible for killing his father in 1832. Never mind that his father had died about a decade earlier and had never set foot on American soil. In Lawrence’s mind, these grievances had to be avenged, leaving him no alternative but to eliminate his antagonist. He plotted to assassinate President Jackson on a damp day in January 1835. Leaving nothing to chance, he had two loaded pistols and a clear shot at point blank range. On January 30 President Jackson was at the Capitol to attend the funeral of Congressman Warren R. Davis of South Carolina. After paying his respects and filing past the casket, President Jackson exited the building. Lawrence was waiting for his opportunity behind a pillar. As the president walked past, Lawrence emerged from his hiding place, aimed and shot at his target. The gun misfired, and immediately Lawrence pulled the second pistol out of his pocket and pulled the trigger. That gun misfired, too. President Jackson heard a commotion and turned around to observe Lawrence being wrestled to the ground. The president himself further subdued his assailant by punching him in the stomach with his cane. During the investigation Lawrence’s guns worked perfectly, and it was determined that the odds of both guns misfiring were 125,000 to 1. The weapons Lawrence used were known not to be reliable in moisture, so it was the weather that actually saved President Jackson’s life. Two and a half months later Lawrence was brought to trial and prosecuted by Francis Scott Key, the writer of The Star Spangled Banner. The jury needed only five minutes of deliberation to find him not guilty by reason of insanity. There was speculation that the toxic chemicals in his paints were a contributing factor to his irrational mental state. Lawrence stayed in several institutions before he became a permanent resident of the Government Hospital for the Insane in Washington D.C. until his death in 1861. QUESTION: What is the biggest or worst thing you’ve ever gotten away with?